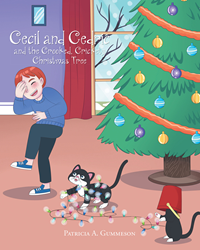 “Cecil and Cedric and the Crooked, Crickety Christmas Tree” from Christian Faith Publishing author Patricia A. Gummeson is a delightful short story about two classy and curious cats named Cecil and Cedric whose Christmas antics cause laughter. “Cecil and Cedric and the Crooked, Crickety Christmas Tree”: a fun-filled short story about two cats that add to a family’s Christmas memories. “Cecil and Cedric and the Crooked, Crickety Christmas Tree” is the creation of published author, Patricia A. Gummeson, a contributing writer to several trade publications who loves to tell stories to the little ones. Published by Christian Faith Publishing, Patricia A. Gummeson’s new book is a creatively written Christmas story on two curious cats’ bizarre adventures—from swatting at Christmas lights to being wrapped by string upon discovering a ball of string—due to their fascinating curiosity. It is an easy-to-read and hilarious work about how pets add color to children’s lives. Read on to find out how Cecil and Cedric make a family’s Christmas a more memorable one. View a synopsis of “Cecil and Cedric and the Crooked, Crickety Christmas Tree” on YouTube. Consumers can purchase “Cecil and Cedric and the Crooked, Crickety Christmas Tree” at traditional brick & mortar bookstores, or online at Amazon.com, Apple iTunes store, or Barnes and Noble. For additional information or inquiries about “Cecil and Cedric and the Crooked, Crickety Christmas Tree”, contact the Christian Faith Publishing media department at 866-554-0919.